Read-Along Love Songs for Baby was designed to be an extra resource for families participating in the Medicaid Maternal Obstetric Service (MOMS) home-visiting program through the Tompkins County Health Department. 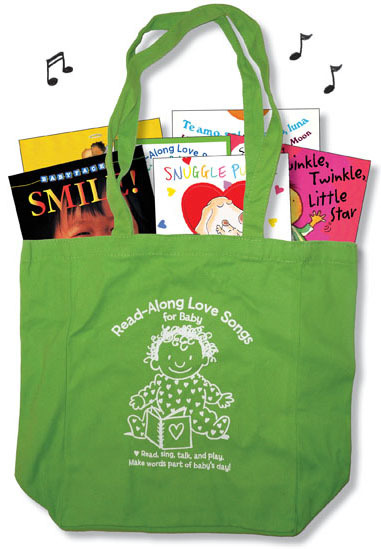 Several high-quality board books featuring diverse characters, Spanish, and sign language come in a reusable green bag. The set comes with a CD with each of the books read and sung aloud. Along with the music and books each bag contains information on infant development and suggestions for fun activities to support learning. In 2018 the sets were also provided to Legally Exempt Childcare providers via the Child Development Council with support from the Community Foundation of Tompkins County. Hearing about how to support early language learning from trusted professionals reinforces the message’s importance. Using relationships that are already established makes it easier to engage with parents and avoids overwhelming them with multiple visits, and streams of information. Read-Along Love Songs for Babies grew out of a retired program called Read-Along Songs. It was developed with funding from the Park Foundation and falls under the umbrella of the Every Baby Every Day initiative that aims to make sure all babies in Tompkins County have enjoyable experiences with language every day. Music is shown to support language acquisition, and can make it easier for little ones to decipher the patterns and structure of speech. Music is universal to all cultures and increases motivation and engagement while decreasing stress. Many parents naturally sing to their babies and this program links that ingrained tendency to literacy development by pairing music with a set of age appropriate books that parents can share with their children while listening to the songs on the CD recorded by local musicians Cal Walker and John Simon.